Editor’s Note: This piece originally ran in our sister publication, Wealthy Retirement. You can subscribe to it here if you haven't already. It's free. 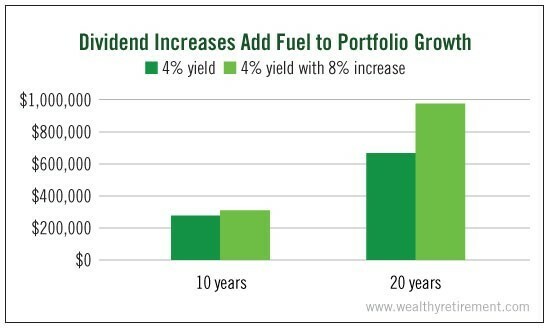 Is there anything that makes an income-focused investor happier than an increase in their dividends? That’s why Dividend Aristocrats have become a well-loved group of stocks since the era of low interest rates began. A Dividend Aristocrat is a member of the S&P 500 that has raised its dividend for 25 years in a row or more. It’s an impressive track record. There are some companies that have raised their dividends for more than 50 years. Coca-Cola (NYSE: KO) has done it for 55 years. American States Water (NYSE: AWR) has raised its dividend each year for an incredible 62 years. When that streak started, Dwight Eisenhower was president and Mickey Mantle was roaming center field for the New York Yankees. I’ve always liked Dividend Aristocrats and other stocks with solid dividend-raising histories. (I call them Perpetual Dividend Raisers.) That’s because by lifting the dividend every year, their managements have set the bar very high. A CEO who does not raise the dividend after a long streak should probably get their resume together. Investors have come to expect annual dividend increases in these companies, and management teams work very hard to be able to provide them. If, after 20 or 30 years, dividend boosts suddenly come to a halt, that would suggest a drastic change in the company’s business or prospects. Companies that raise their dividends every year help investors fight inflation. Though inflation is low today, the historical average is more than 3% per year. That can meaningfully eat away at a person’s buying power. If prices rise just 3% per year, what costs $1 today will cost $1.34 in 10 years. Even with the past 10 years of very low inflation, you need 19% more money today to buy the same goods and services you did in 2007. Owning stocks that raise their dividends every year by more than the inflation rate increases your buying power. If you’re using dividends as part of your income strategy in retirement, you not only keep up with inflation but also beat it. Let’s assume you’re generating $10,000 per year in dividend income and your stocks grow their dividends by an average of 8% per year. Next year, you receive $10,800. At 3% inflation, you need only $10,300 to keep up. You now have an extra $500 to save, invest or spend. Lastly, if you’re reinvesting your dividends, owning Perpetual Dividend Raisers helps you step on the gas of the compounding machine. Let’s say you have a $100,000 portfolio of dividend stocks with an average yield of 4%, and it climbs by the historical average of the S&P 500. You reinvest the dividend. After 10 years, your $100,000 will be worth $278,544, and you’ll receive about $5,300 per year in dividends. After 20 years, your nest egg is worth $668,103. And the portfolio spins off $6,100 per year in dividends. 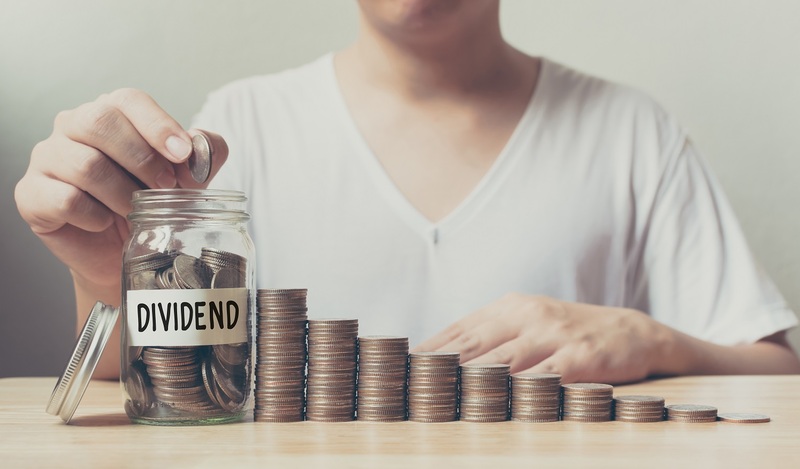 If instead of earning a flat 4%, your portfolio starts off yielding 4% - but the companies average an 8% dividend boost every year - the numbers increase significantly. In 10 years, you have $310,764… $32,000 more than the first scenario. More importantly, you’re now generating $11,780 in dividends, more than double what you would have made if the company did not boost the payout. In 20 years, the portfolio is worth $978,406 - a whopping 46% more than the earlier case. And if at that point you’re ready to stop reinvesting the dividend and take it as income, you’ll receive $38,290. That’s a far cry from the $6,100 you’d get without the dividend increases. Investing in Perpetual Dividend Raisers can be the difference between a comfortable retirement and just scraping by. Buy stocks that raise their dividends every year, and hold on to them for as long as you can. It’s the best way that I know to secure a wealthy retirement. P.S. For more information on generating double-digit yields and annual returns over the long haul, check out my book Get Rich With Dividends. It will teach you everything you need to know about identifying and investing in Perpetual Dividend Raisers. Click here to learn more. Marc’s Oxford Income Letter service presents investors with stocks that have both income-generating potential and market strength. REITs often fit the bill. And it’s no wonder that one of Marc’s most lucrative picks is a very distinctive REIT. It’s a high-tech trust that owns data centers. It’s called Digital Realty Trust (NYSE: DLR), and it’s part of Marc’s Compound Income Portfolio. In 2014, when I recommended Digital Realty Trust, I mentioned that many analysts were not on board and that 29% of the float had been sold short. Since that time, the stock is up 53%. Glad I wasn’t one of those shorts or one of those bearish analysts who got left in the dust. I recommended Digital Realty because it operates facilities full of servers for large companies. Last I checked, the world was not getting less technological. More and more data is being collected and analyzed. More computing power is necessary to operate corporate websites and intranets. In fact, technology is absolutely booming. ●	The world’s information will double every two years. ●	The volume of digital data is expected to grow 40% to 50% per year. ●	By 2020, the world will generate 50 times the amount of information and 75 times the number of information containers. ●	2013 worldwide file and object-based storage market revenues were $23 billion. They’re expected to be $38 billion in 2017. And all of these demands require servers and somewhere to put them, keep them cool, and make sure they’re running. That’s where Digital Realty comes in. Digital Realty boasts blue chip companies as some of its largest customers. IBM (NYSE: IBM), AT&T (NYSE: T), Verizon (NYSE: VZ), Morgan Stanley (NYSE: MS) and JPMorgan Chase (NYSE: JPM) are all among its top 10 customers. Digital Realty serves more than 600 customers in 131 locations around the globe. As the company reports, it has grown FFO and its dividend every year since it went public in 2004.